Christopher Jennings is a performing artist, organist, pianist, and conductor who is passionate about a wide array of musical styles. In addition to playing solo concerts, he enjoys collaborating with other instrumentalists and choral ensembles. He loves to promote the role of the organ in the classical music scene and beyond in order to bring its music to a variety of audiences. Christopher is the newly appointed Organist & Choirmaster of Calvary Episcopal Church, Summit, NJ where he heads up an active music program in the fastest-growing parish in the diocese. For the past seven years, Christopher was ﻿Associate Organist-Choirmaster and Music Associate for Children & Youth at St. James' Church Madison Avenue, New York City. 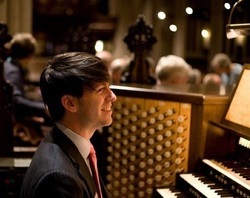 His previous posts include Organist & Choirmaster at St. James’s Church, West Hartford, Connecticut and Assistant Organist at Trinity Church on-the-Green, New Haven, Connecticut. Christopher holds the Master of Music Degree from Yale University School of Music and Institute of Sacred Music and the Bachelor of Music degree from Indiana University. His teachers have included Marilyn Keiser, Martin Jean, William Porter, and Michael Messina. He has recently completed a certificate in Well-Coordinated Injury-Preventive Keyboard Technique, studying with the world-renowned pianist Barbara Lister-Sink. Christopher has an increasingly busy concert schedule. A featured artist in the 2012 Piccolo Spoleto Festival in Charleston, SC, he has also recently collaborated with the New York Repertory Orchestra and the Salomé Chamber Orchestra. Recent and upcoming venues include Constitution Hall in Washington, D.C. St. Thomas Church Fifth Avenue and the Church of St. Mary the Virgin in New York City, the St. Cecilia Music Series at Trinity Church, Tulsa, OK, the East Texas Organ Festival in Kilgore, TX, St. Paul's Chestnut Hill, Philadelphia, and Cadet Chapel, West Point Military Academy. Christopher is also featured in regular recitals and oratorio accompaniments at St. James’ Church and throughout New York City. While a student at Yale, he appeared on the television program Jeopardy as a “clue,” playing the famed E.M. Skinner organ at Woolsey Hall. He also appears regularly in concerts as a part of the Duo Organists team with Brian Harlow. Over the past year Christopher has appeared on American Public Media's Pipedreams several times, with recordings of live performances at St. James' NYC and at First Presbyterian, Kilgore, TX. He has released two solo albums, "French Sixths" and "The Storm King" and is the organ accompanist for two Choral CDs, "Call to Remembrance" by the Choir of St. Paul's Church, Fairfield Connecticut, and "Songs for the Centuries" by the choirs of St. James' Church, New York City.